All lined up outside the youth hostel ready to start Sunday’s ride back to Sheffield. 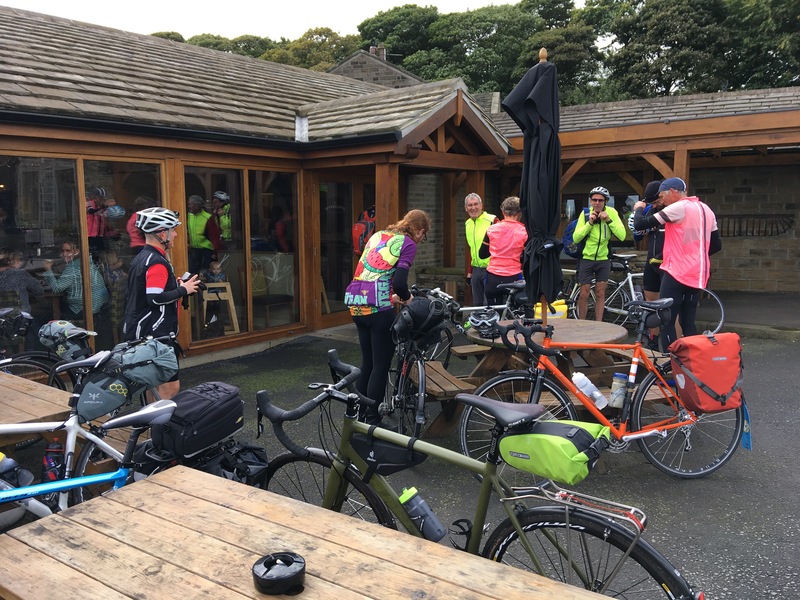 The group met up at Wortley village, north of Sheffield, at 8 am where we organised ourselves into fast and slow groups for the ride over to Slaidburn. 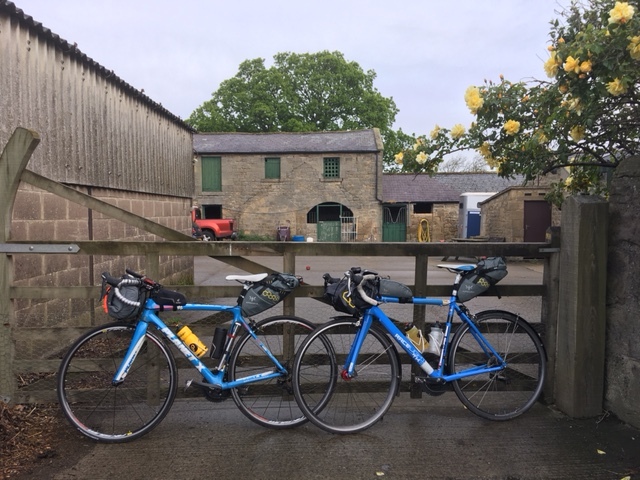 The route took us out through the north of Sheffield via the villages west of Barnsley and over to Emley Moor where we had our breakfast cafe stop at Thorncliffe Farm. The slower group had already been held up by a puncture early into the ride and arrived just as the fast group were getting ready to leave – the last we’d see of them for the rest of the journey. In true CTC style we managed to while away a good hour in the cafe before heading off across the hills west of Wakefield. We descended into Dewsbury where we picked up the Spen Valley Greenway, an old railway line that links the West Yorkshire towns of Heckmondwike, Cleackheaton and Bradford, providing cyclists and walkers with a lovely, traffic-free route in an otherwise densely populated area that was once heavily industrialised. We stayed on the trail for around eight miles until we reached the outskirts of Bradford to start the climb over to the Aire Valley. We left the trail at Low Moor and climbed up through Shelf and Queensbury before stopping for lunch at Asa Nicholson’s Bakery cafe at Keelham. After lunch we wound our way over the tops of Denholme and Ogden to avoid the traffic through the village centre on the A629. 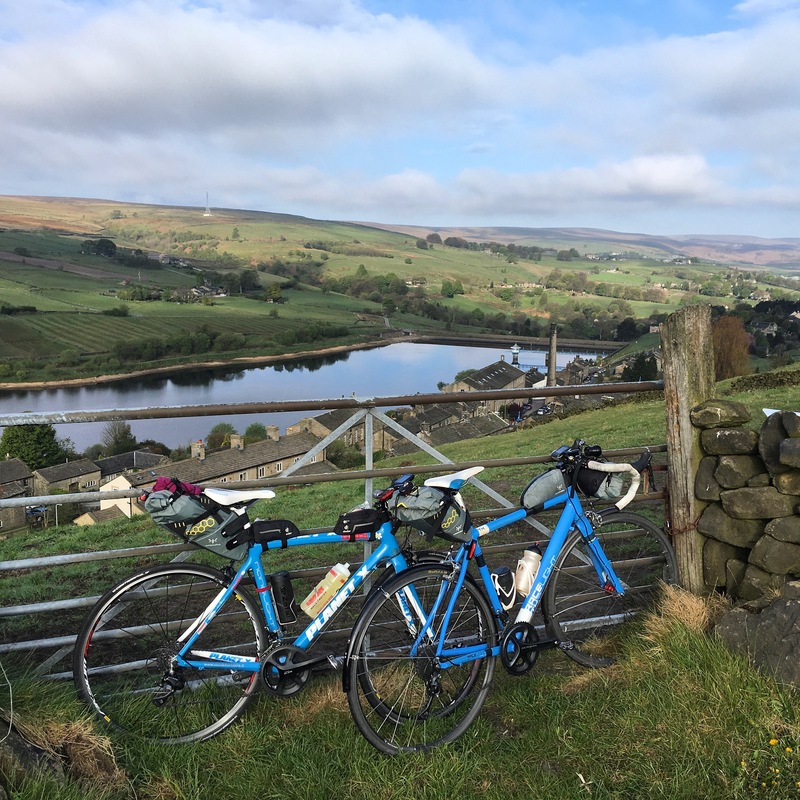 The route took in some spectacular views over to Leeming reservoir and Haworth before eventually rejoining the A629 and dropping down into Keighley. From Keighley we avoided the busy A65 by taking the hillier but quieter route through Steeton, Crosshills and Cononley. The weather took a turn for the worse and we had a few good soakings in heavy but short showers enroute to Gargrave. Another puncture conspired to slow us down further so we forfeited the last cafe stop at Gargrave in favour of an earlier arrival at the youth hostel. 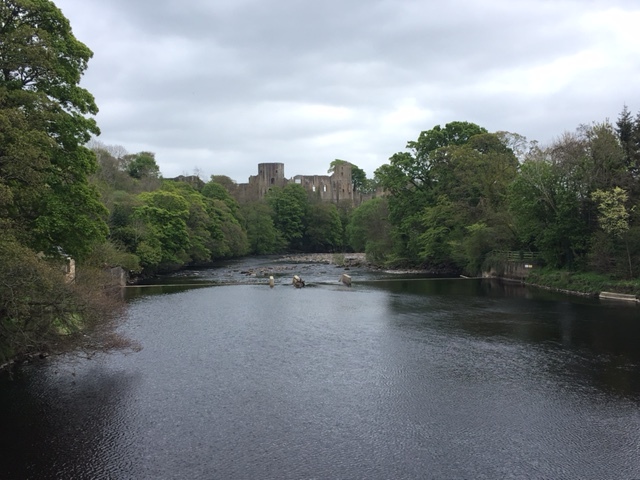 The final leg of the route followed the edge of the Dales through Long Preston, Wigglesworth and Tosside providing us with great views across to Ingleborough. By this point the slower group fractured into a few little sub-groups as legs were starting to tire on the ups and downs of the quiet, lumpy lanes. The last few riders made it to the hostel around 7pm and were pleased to discover that the fast group, who’d arrived around 5pm, had already got dinner well underway. 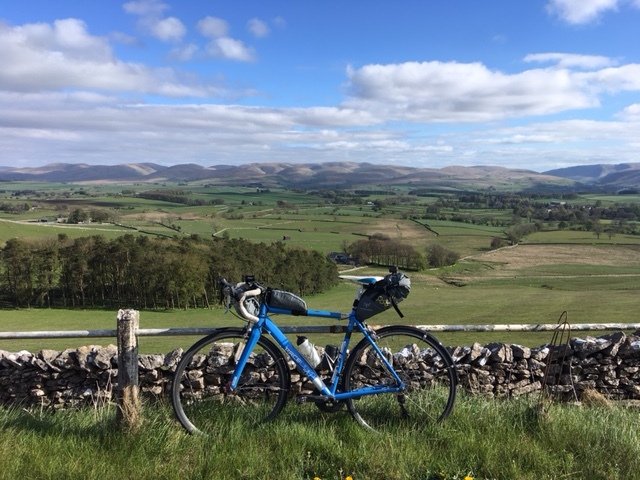 The harder of the day’s two circular rides on offer was a hilly 60-miler up over the Trough of Bowland and out towards the coast to the Lantern O’er Lune cafe at Glasson Dock before heading back inland over to Caton, just east of Lancaster. At Caton the route crossed the River Lune and joined the Way of the Roses cycle route eastbound until the village of Wray where it turned south to climb back over the moors to Slaidburn via the summit of White Hill. Looking down from White Hill to Stocks Reservoir. Isn’t it all downhill to London? Last weekend I got the opportunity to cycle down to London, something that has been on my ‘to do’ list for ages but one that I’ve never managed to get around to planning. Thanks to our friend Peter, this time all of the planning was taken care of and Julie and I had been invited along. He is currently training for LEL and, just like us, trying to get some big miles in when the opportunity arises. 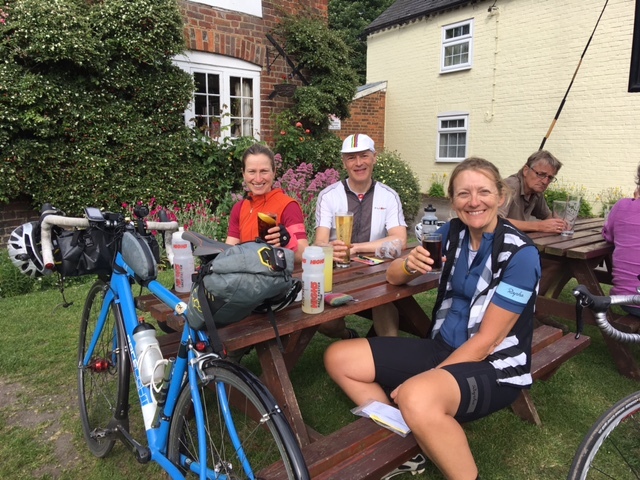 Peter had arranged to pedal down from Sheffield to his sister’s in Teddington in a day and then take part in the Ditchling Devil 200km audax from Wimbledon on the following Sunday, clocking up just over 500km in a weekend. 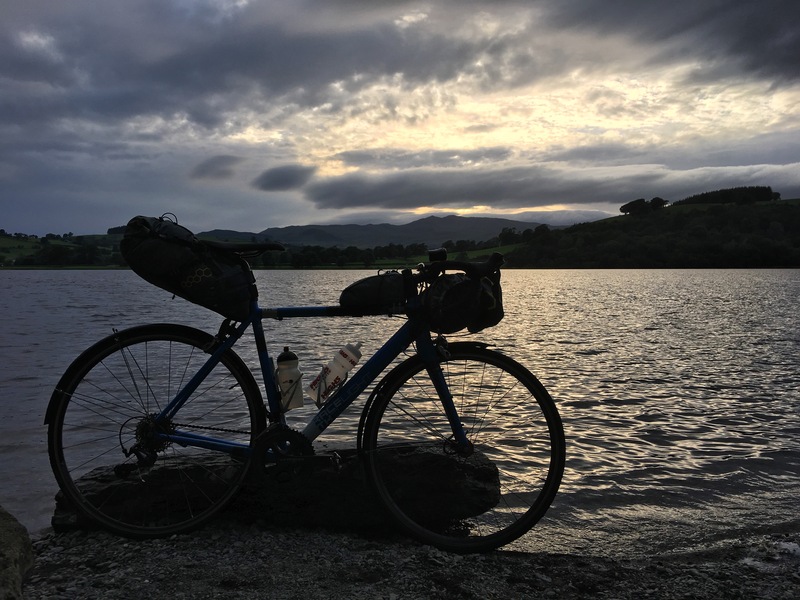 Peter designed the Sheffield to London route to be ridden as a 300km DIY audax, which is basically an audax that you plan yourself. When you design a route you must plot the shortest distance between two points, so if you want to avoid main roads you can put in a control stop wherever you need to change direction. 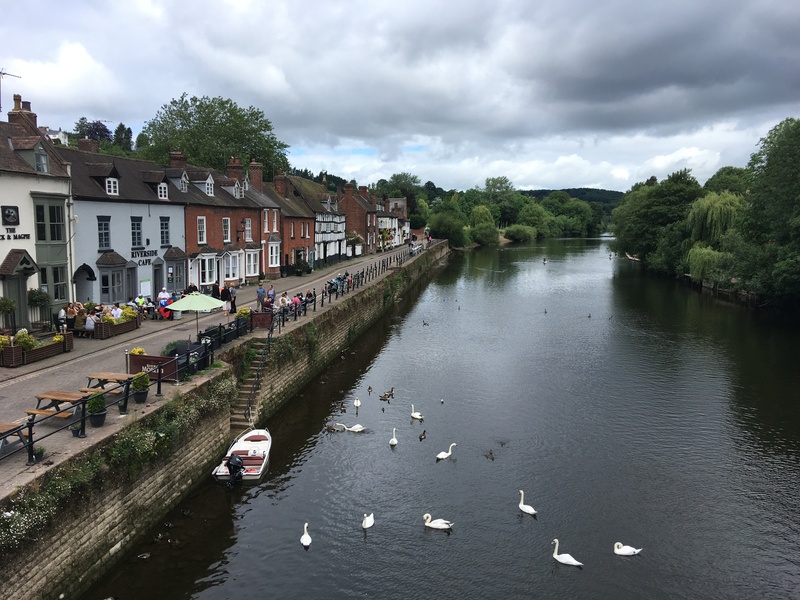 Peter had managed to plot a pretty straight route down through Bolsover, skirting around Nottingham, Northampton and Milton Keynes before heading slightly south-west over the Chilterns to Beaconsfield, Windsor and finally following the Thames to Teddington. We met up in Nether Edge at 5.30am on Saturday morning outside the Sainsbury’s cashpoint where we picked up out first control receipt of the day. After a night of heavy rain, the weather was looking good and the wind wasn’t too strong so we expected to make good progress. The roads were deserted, giving us a pretty-much, traffic-free run all the way to Staveley for our next control receipt before heading on through Bolsover and the quiet lanes of north Nottinghamshire. 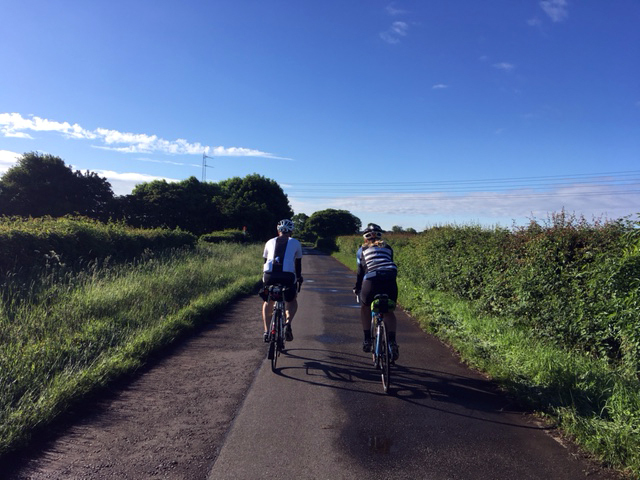 Early morning rides are a great opportunity to catch some wildlife and en route we saw a barn owl and a young fox playing in the road. The odd stretch on a busy road is often unavoidable on an audax, especially when you need to get across a river. We’d planned our Breakfast stop at Bingham, a village east of Nottingham, 75 km into the ride and our third control of the day. This meant crossing the Trent at Gunthorpe on the A6097 which is a straight, fast road with heavy traffic. 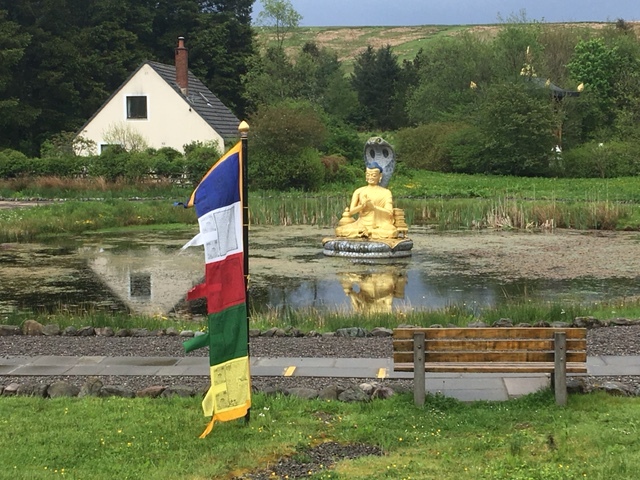 Although it was only around 9am the traffic had picked up enough to make it a fairly unpleasant experience as the road is narrow in places and impatient drivers don’t like being held up by bikes, so we were all pretty glad to get to the roundabout turnoff to Bingham. 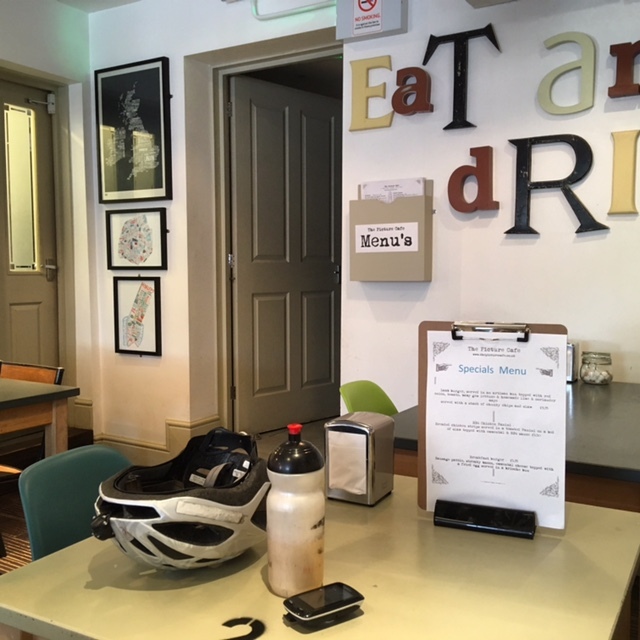 There are a few cafes to choose from in Bingham and judging by the amount of cyclists we saw arriving in the village square it’s a popular meeting place for local cycling clubs. Our cafe of choice was the Picture Cafe on the square, lovely decor, a good menu and, most importantly, good, strong coffee. We were all impressed enough to consider planning a future day ride from Sheffield. Keeping an eye on the time we were back on the road for just after 10am and on to the quiet country lanes that run parallel to the A46, through Nottinghamshire and Leicestershire. At Market Harborough we headed off-road on the Brampton Valley Way. 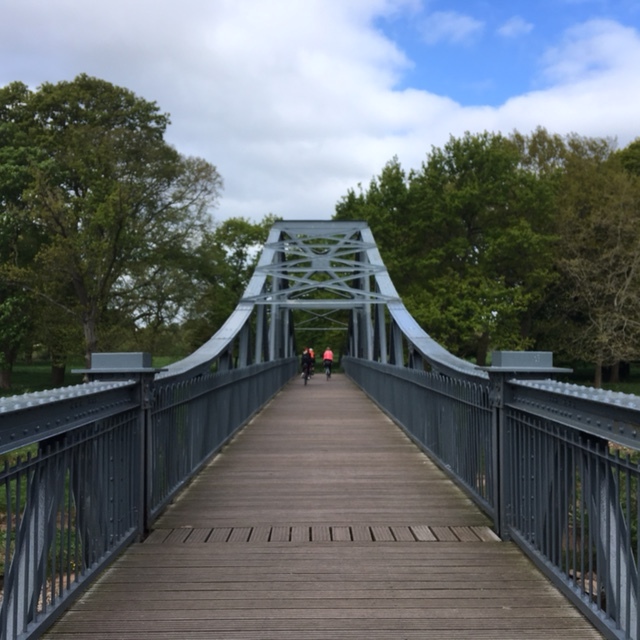 This 14-mile cycle trail runs from Market Harborough to the outskirts of Northampton along the track bed of a disused railway line and is part of National Cycle Route 6. 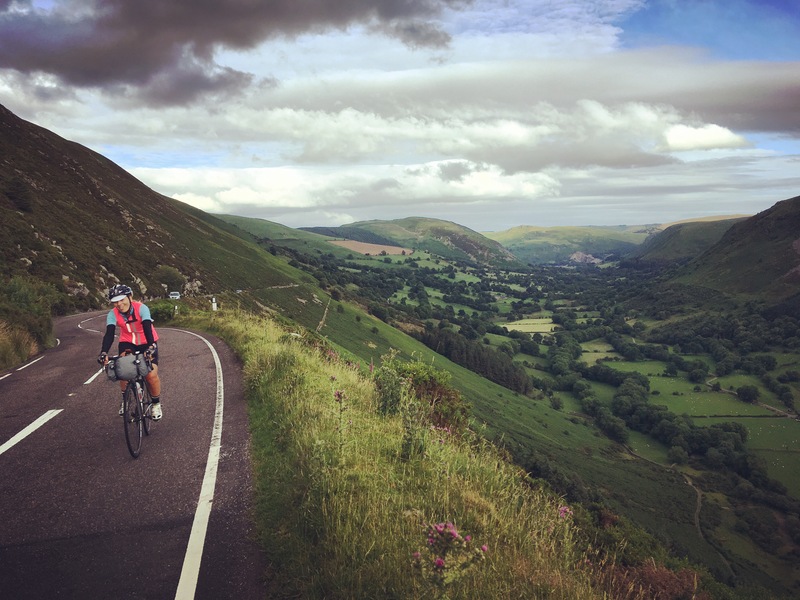 Traffic-free route always sound like a good idea – and they are for leisure cycling and family days out – but when you’re covering big miles, often the surface can be a little hard-going on a road bike and they can slow you down quite a bit so we all found the 14 miles pretty tedious. We also encountered some unexpected tunnels – long, muddy, unlit tunnels that were pretty impossible to ride through on skinny 23mm tyres so we had a bit of pushing to do too. 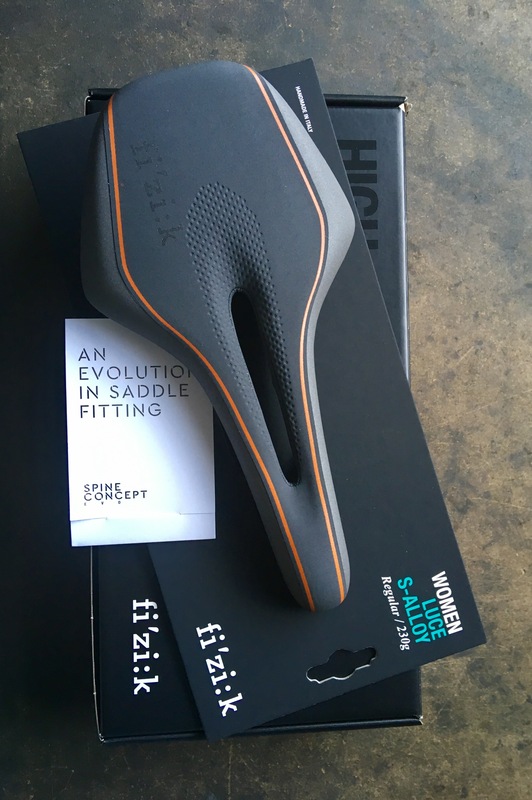 This was also the first long ride on my new Fizik Luce saddle and before hitting the trail, the first 100km had been a comfortable ride but the new saddle has quite angular edges on it’s ‘wingflex’ system and, jiggled around on the bumpy trail surface, I found that the angular edges on the saddle’s ‘wings’ were starting to rub on the back of my legs when I sat back in the saddle. As I still had nearly 200km to go, this was a bit worrying. The route spat us out on the outskirts of Northampton, our fourth control of the day and destination for lunch. We’d lost a bit of time on the trail and were around half an hour behind schedule, arriving in town just after 2pm, but we were all pretty hungry and ready for a spell off the bike. We headed up Gold Street to All Saints Church and settled for lunch in the All Saints Bistro which is part of the church building. There’s plenty of covered, outside seating which was good for keeping an eye on the bikes locked up in the church square. The route out of Northampton took us south, just skirting the edge of Milton Keynes, We were heading into commuter belt and the villages were starting to look a little more well-kept the further south we traveled. The village of Stewkley stands out as a lovely example with some fine old houses and thatched cottages. The cars were also getting bigger and more expensive but unfortunately the drivers’ manners weren’t improving any and we had a couple of near misses with people taking crazy risks to overtake us rather than wait behind. The fifth control of the day was The Half Moon at Wilstone, a traditional english pub with friendly staff who were interested to know where we’d come from and where we were going. We were met with the now fairly familiar cries of “Where? Sheffield? Today!”. It was 4.30pm and we were hot in the afternoon sunshine so we ordered large, cold drinks all-round. Peter pushed the boat out with a lager shandy. We weren’t quite ready for a pub meal and there wasn’t a shop so we had to make do with the emergency bagels we’d been carrying around with us all day. 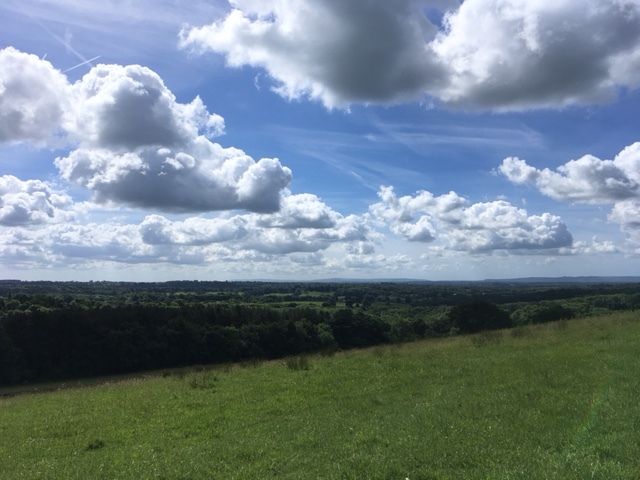 For the most part, once we were away from Sheffield, apart from the trail, the route had been pretty flat and fast but we were now heading into the Chilterns and that meant a few hills. Nothing by Sheffield standards but when you’ve already got 200km in your legs even the smallest incline can be a be a bit of hard work. Peter had done his best to keep the route off the main roads which meant that we found ourselves on some very narrow and not very well-kept country lanes. Some of them were so badly potholed that we gave up trying to negotiate the holes and got off to push for the second time in the day. The sky had been growing progressively darker and by the time we got to the outskirts of Beaconsfield the heavens opened, and boy, did they open. We were absolutely soaked through to the skin in seconds. The force of the rain hitting the hot roads made the surface water frothy and visibility was poor. It rained solidly for a good 15 minutes but we pedaled out of it and by the time we’d reached the next control point at Dorney the roads were completely dry. We definitely got a few funny stares from the early evening diners as we entered the Palmer’s Arms in Dorney. We were soaking wet and bedraggled and the rain hadn’t reached the village yet so outside it was still a lovely summer’s evening. We didn’t plan on stopping around long but we needed a control receipt so we ordered drinks and crisps and made good use of the facilities before heading through Windsor and on to Staines. Old Will the Conqueror certainly knew what he was doing when he chose Windsor as the spot to build a castle. As we pedaled away from Dorney, across the plain of the Thames, the castle was the focal point of skyline, shining gold in the setting sun. 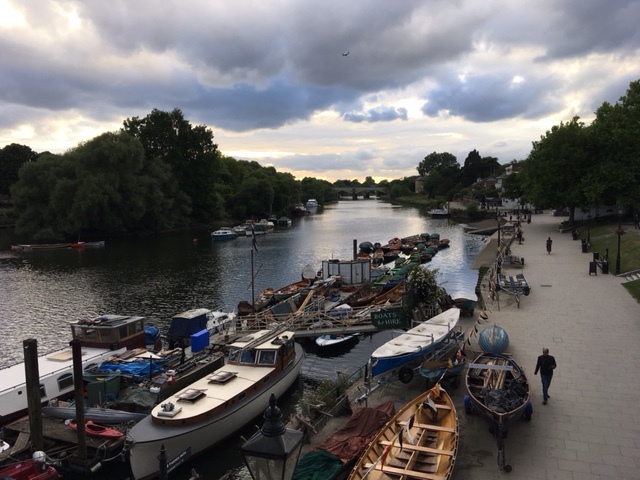 We paused for a quick photo stop over the bridge at Eton before climbing on up to Windsor town centre, full of tourists and people partying on an early Saturday evening. Petrol Station forecourt? Must be an audax! Next stop Staines. We were all pretty starving by this point as we’d not eaten anything substantial since we’d polished off the emergency bagels. On long rides Julie and I have gotten ourselves into the rhythm of eating something small every hour even if we don’t feel hungry, in order to keep blood sugar levels as even as possible to prevent bonking out. It seems to work well for us but relies upon us topping up our food supplies whenever we get the opportunity. 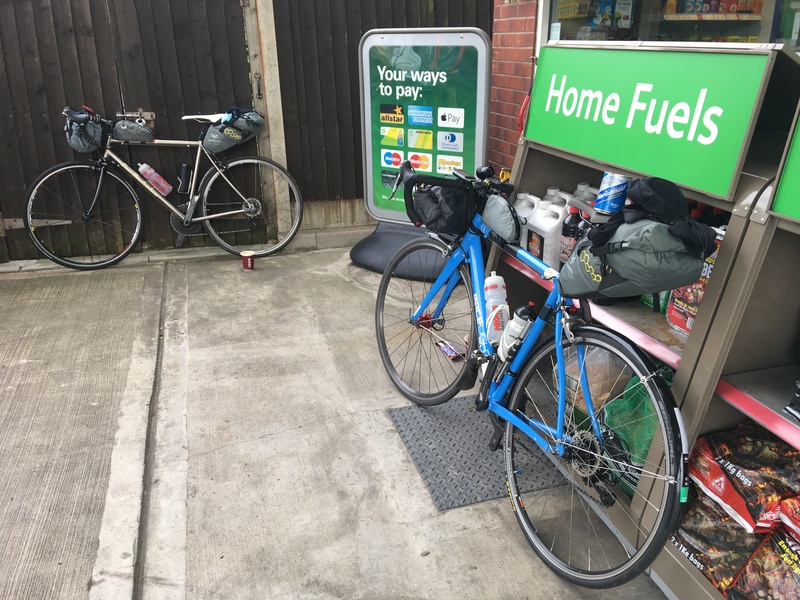 Peter doesn’t seem to need to eat as much as we do and was managing ok by just eating at controls but we were unanimously thrilled to see a Sainsbury’s petrol station the minute it came into view. Peter’s sister had dinner waiting for us in Teddington as we’d planned to arrive for 9.30 but as it was already 9pm and we still had 20km left, we needed something to tide us over. I opted for a bag of popcorn to fill me up and a carton of iced coffee for a caffeine hit while Julie and Peter shared a sandwich. The cashiers were pretty impressed by our achievements so far and wished us well on the final leg of our journey. Staines on a Saturday night is quite a rowdy affair so we were glad that we’d not needed to stop in the centre of town. We were hitting the outskirts of greater London now, roads were busier and traffic lights slowed us down quite a bit making the last 15km pretty slowgoing as we rode through the suburbs of Ashford and Feltham. 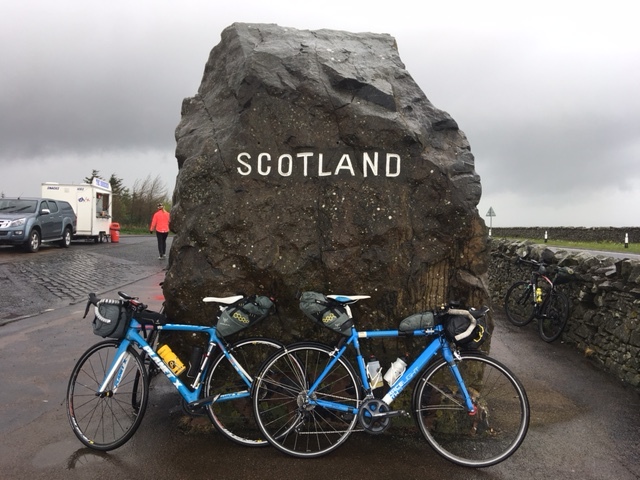 By 280km the back of my legs had pretty-much had enough of those angular edges on my saddle and I had to keep continually repositioning myself, which was a real shame because the nose of the saddle really was very comfortable. We finally made it to our destination on Teddington High Street at 10.24pm. We needed to make sure that our arrival was documented so we immediately found a cashpoint to validate our journey of 301km before heading over to Peter’s sisters. We were given a very warm welcome by Alison and Michael, along with plenty of food and a lovely, hot shower. 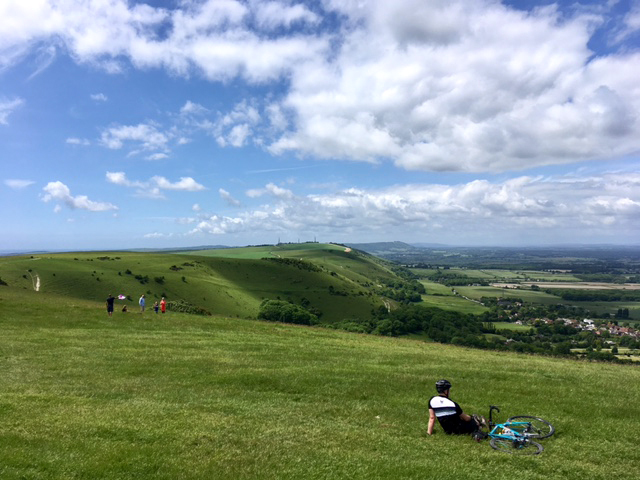 By 11.30 we were in bed as we needed to get a few hours of sleep in preparation for our next adventure, the Ditchling Devil 200km to Brighton and back on Sunday… but that’s another story. Author adminPosted on June 8, 2017 Categories UncategorizedLeave a comment on Isn’t it all downhill to London? My friends Sian and Esther are currently training for LEL this summer. 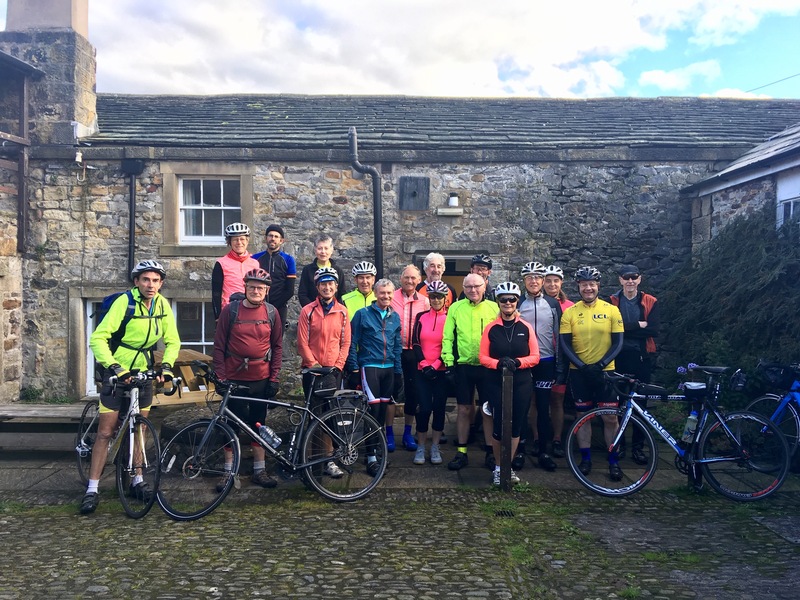 Last Sunday and Monday they decided to ride part of the route from Pocklington in North Yorkshire, across the north Pennines to Carlisle and back again. 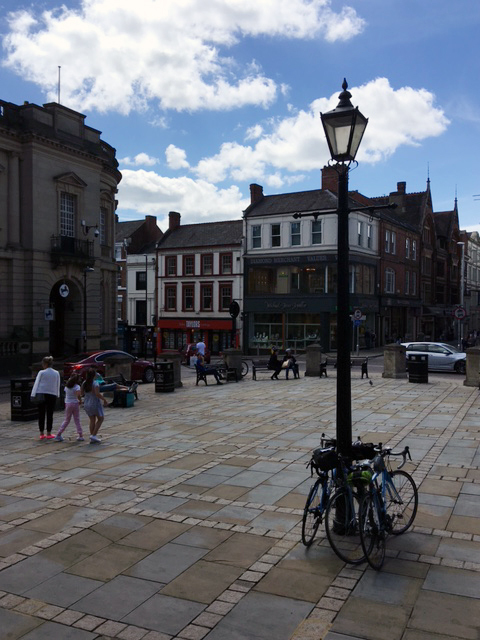 Julie and I decided to cycle up to Carlisle to meet them and ride the route back with them to York the following day. To get the miles in on day one I’d planned a route that took a detour to Slaidburn as I’m planning a weekend residential there for the Sheffield Cycling UK member group in September and it was a good opportunity to recce the last part of the route from Keighley which is pretty rolling but not too taxing. 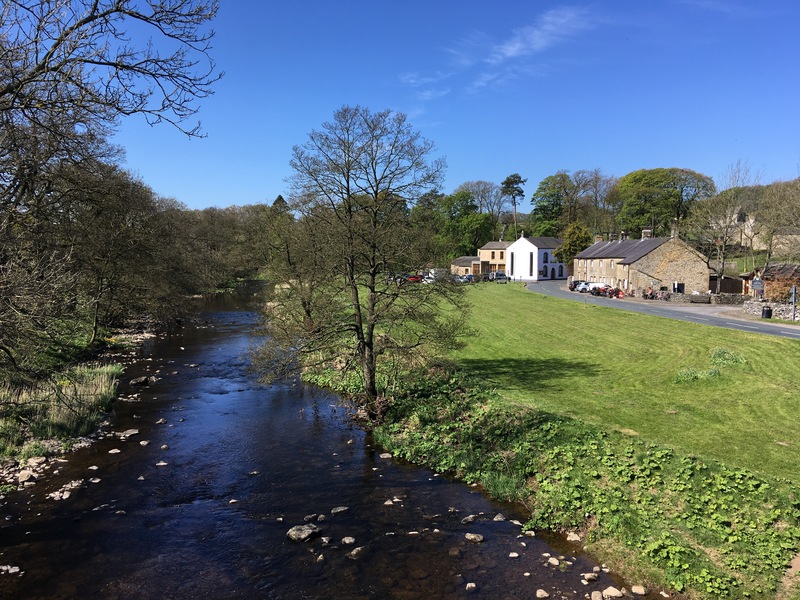 After a quick cuppa and a toasted teacake sat out in the Slaidburn sunshine, we rode up through the trough of Bowland, one of my favourite places to ride. It’s a tough climb, especially after a cafe stop, but worth it. You can even see the sea (and Blackpool Tower on the horizon) on a good day – and today was a good day. We’d been travelling mainly west with a slight crosswind over to Lancashire but by the time we reached Caton we were heading north and riding directly into a headwind which stayed with us all the way to Carlisle, not too strong but just enough to make the journey a bit more of an effort. By lunch we’d reached Kirby Lonsdale and as we were trying to keep stops as brief as possible, rather than head into town we pedalled down to Devil’s Bridge, a popular stop with local motorbikers, for another cuppa and a huge cheese, potato and onion cake – basically a massive carb-fest butty – while being entertained by the kids diving off the rocks into the river below. 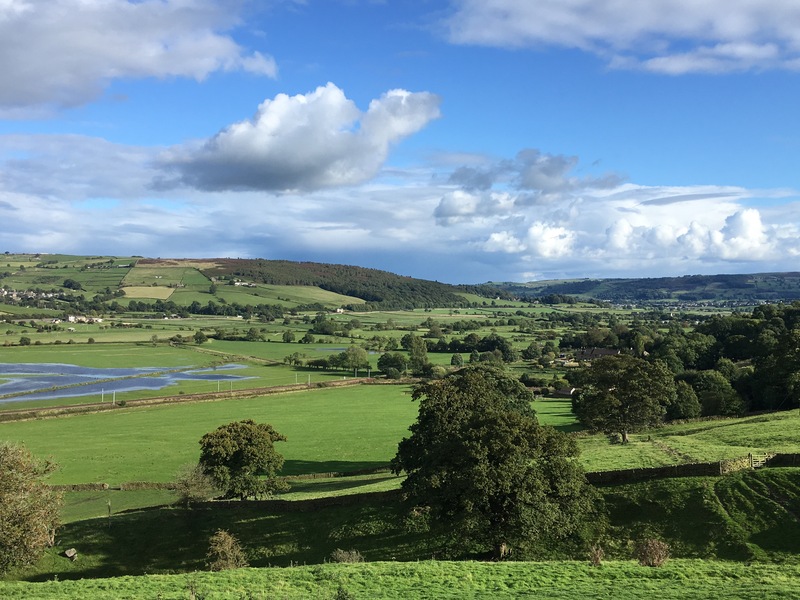 We continued north cycling through the rolling hills of the Lune Valley, often quite steep at times, crossing the M6 twice, up to the village of Orton. 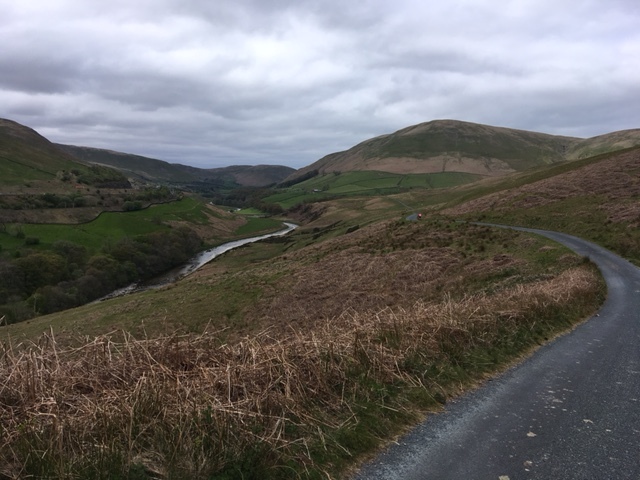 The Lune Valley and Howgill Fells sit in between the Lake District and the Yorkshire Dales. 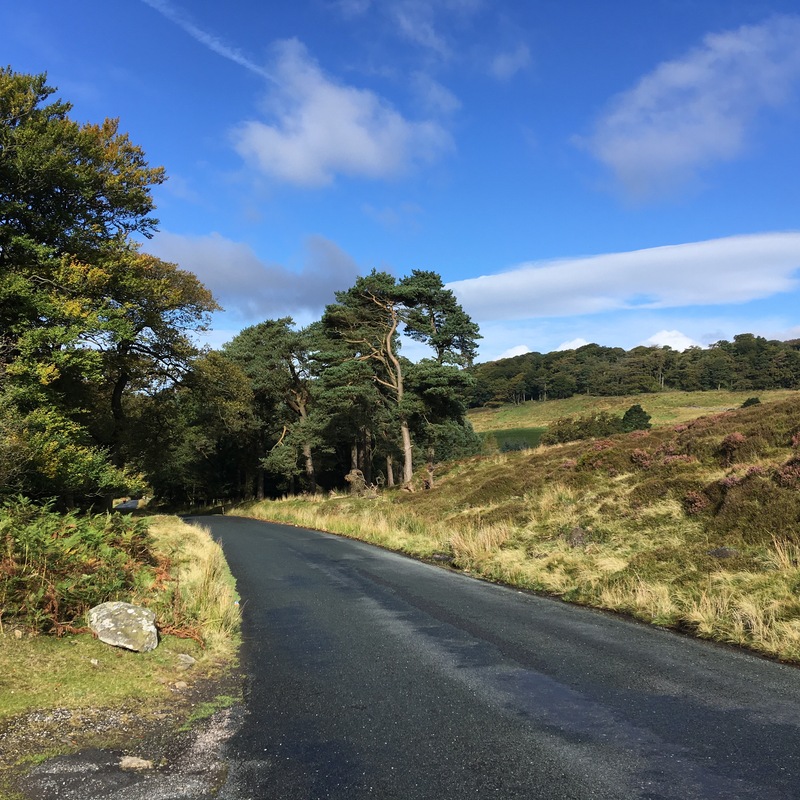 Many people only encounter it while speeding through it up and down the M6 and it often gets overlooked by tourists which means lots of quiet, traffic-free roads perfect for cyclists. The Lune Valley. This lovely, quiet road runs along the other side of the valley from the M6 and West Coast mainline. We just made it to our last cafe stop of the day in Orton as it was closing. We had yet another cuppa (the coffee machine was being cleaned out) and stocked up on snacks. Portable food options were a bit thin on the ground and I had to settle for a slab of fruit cake which, although tasty, must’ve added an extra kilo to the overall weight of my bike. By the village of Morland we dropped down a steep hill to a ford with a footbridge. The local rugby club were having a bit of a party in the neighbouring field with a visiting team from St. Malo. After a bit of polite banter, and the invitation to stop for a pint, the visiting guests insisted on offering to carry our bikes across the footbridge. Julie was having none of it but my bike was whisked out of my hands before I had a chance to put up a fight. 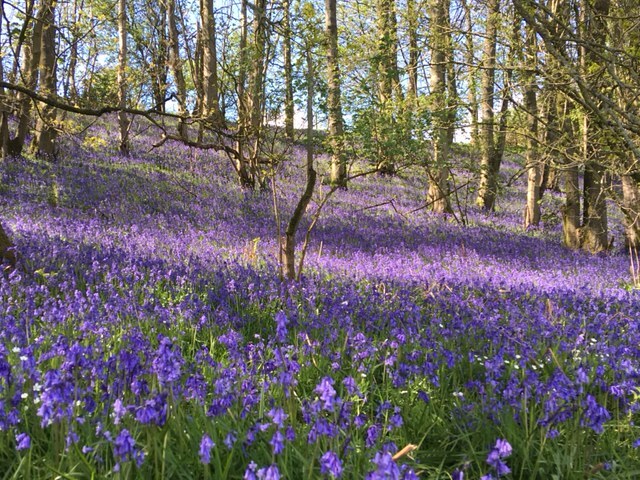 North of the A66, the remainder of our journey took us along the Eden Valley through Kirkoswald and Armathwaite. This section following the River Eden was the flattest part of the route, which was welcome by this point in the day as we’d already clocked up over 3000m of climbing. Saying that, I’d somehow still managed to unwittingly sneak in a couple more short 15% climbs in the last 20 km! 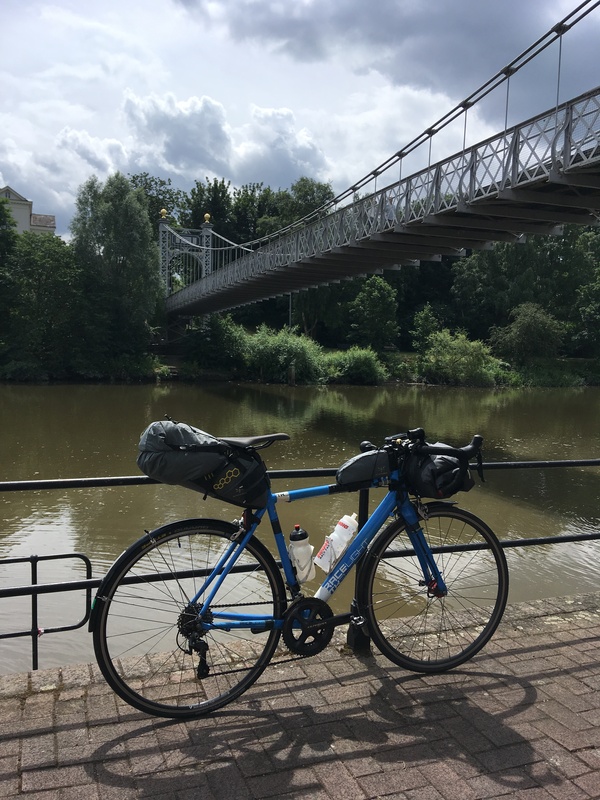 After 13 hours, 226km and 3850m of climbing, we arrived at the Travelodge in Carlisle just after 8.30pm, feeling tired but still in pretty good shape and definitely ready for our tea. We caught up with Sian and Esther over breakfast to hear tales of their journey up from Pocklington the day before. 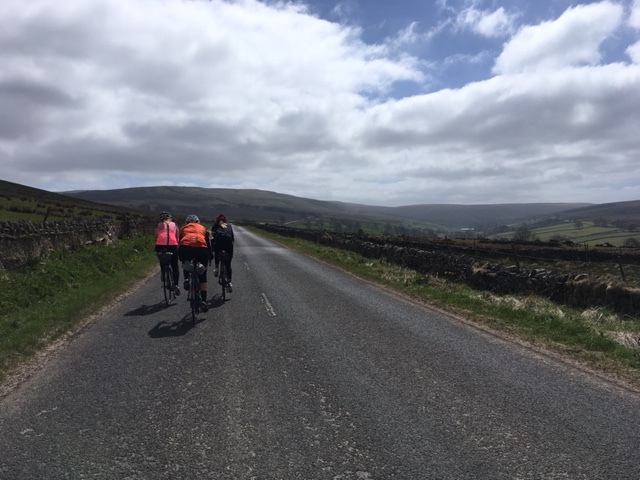 They’d been following a 230km stretch of the LEL route through Upper Teesdale over to Alston – the route we were now going to take in reverse. 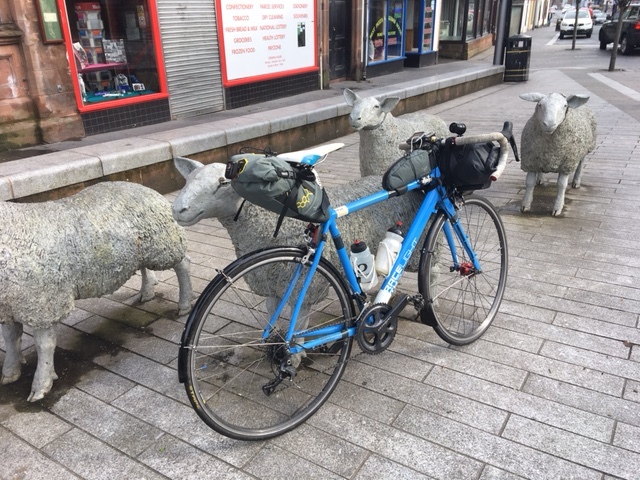 Battling a headwind up over Yad Moss with panniers had worn Esther out a bit so she decided to ditch the panniers at the Travelodge for the return leg. 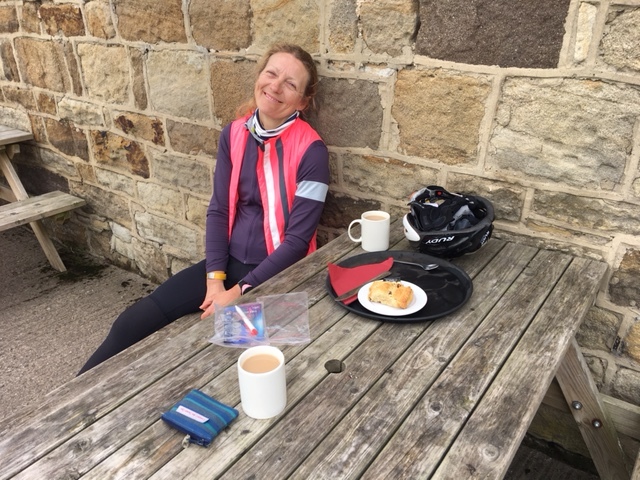 We were on the road by 8.30am and made it across the rolling hills to Alston by 11.00am for a quick cafe stop before the big climb of the day. 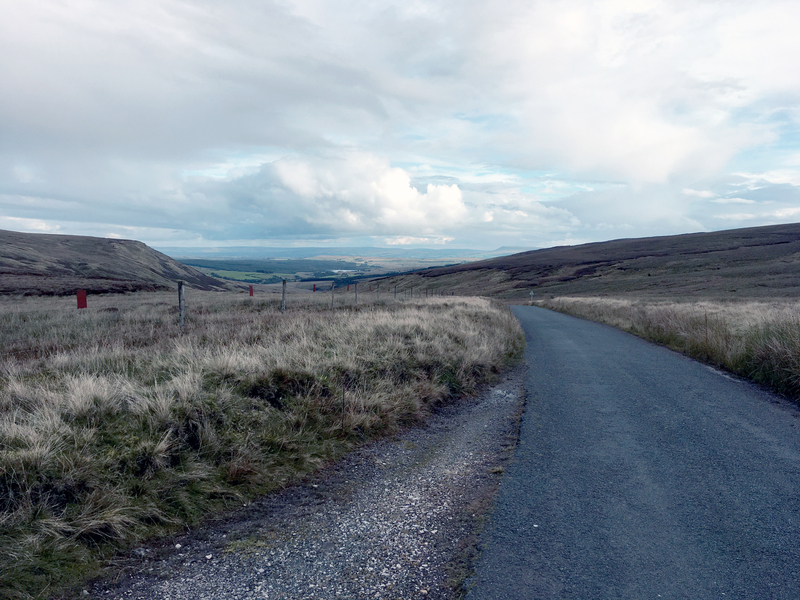 Unlike the previous day’s constant ups and downs, today we had the one big climb across the North Pennines, over Alston Moor and Yad Moss before dropping down to Langdon Beck and Upper Teesdale. 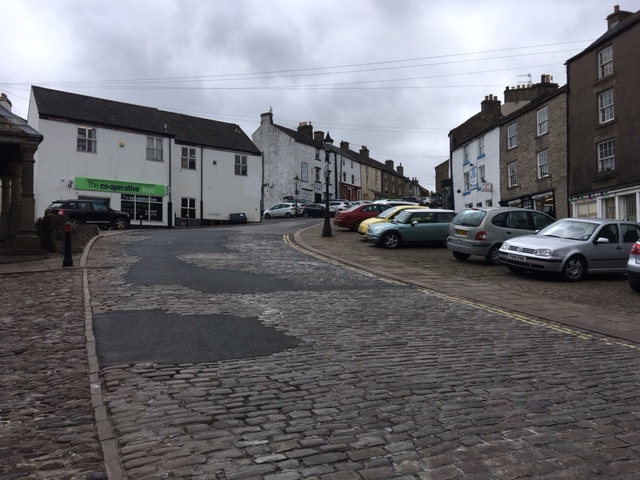 The cobbled climb up through Alston. A good excuse to stop for a cuppa. 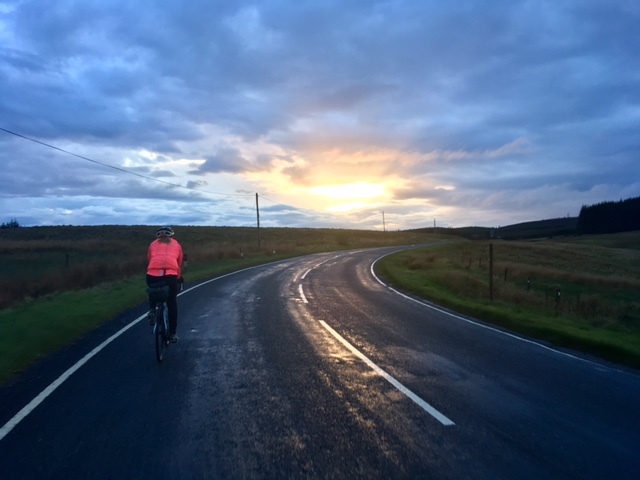 Cycling across the North Pennines is just breathtaking. If you’ve not been up here on a bike then I can definitely recommend it – it’s a bit like the Dark Peak minus all of the crowds. The roads are completely deserted and it feels very remote and rugged in this part of the world even though we were only 40 miles or so from Newcastle. Upper Teesdale. Not a soul in sight for miles. 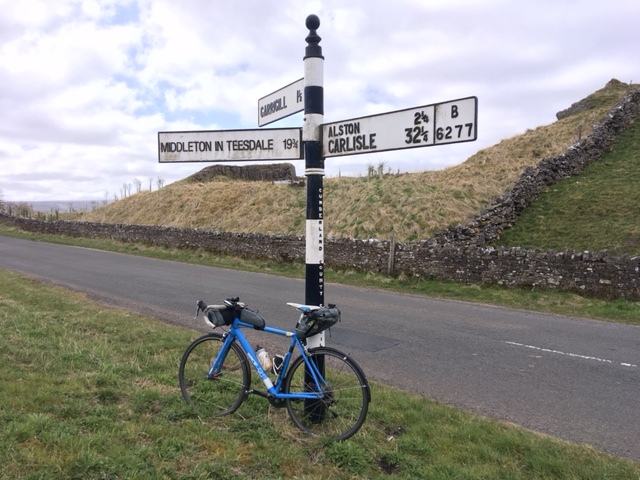 It was pretty chilly on the tops but for the most part we had a tailwind and were soon descending through Upper Teesdale to Middleton and on to Lunch in Barnard Castle. After a longish lunch we headed steadily south west across the Vale of York to Thirsk. Even though this section of the ride was flat, we were all riding on tired legs and feeling the effects of the day before and the constant pedalling required on the flat was still pretty hard work for all of us. The flat lands can get a bit monotonous – we all had our low moments but never at the same time and riding together you can keep each other going when it starts to get tough. By the time we arrived at Thirsk we were ready for another rest stop. Arriving at 6.30pm options were pretty limited and we ended up at the local Tesco stocking up on snacks and water for the final leg. 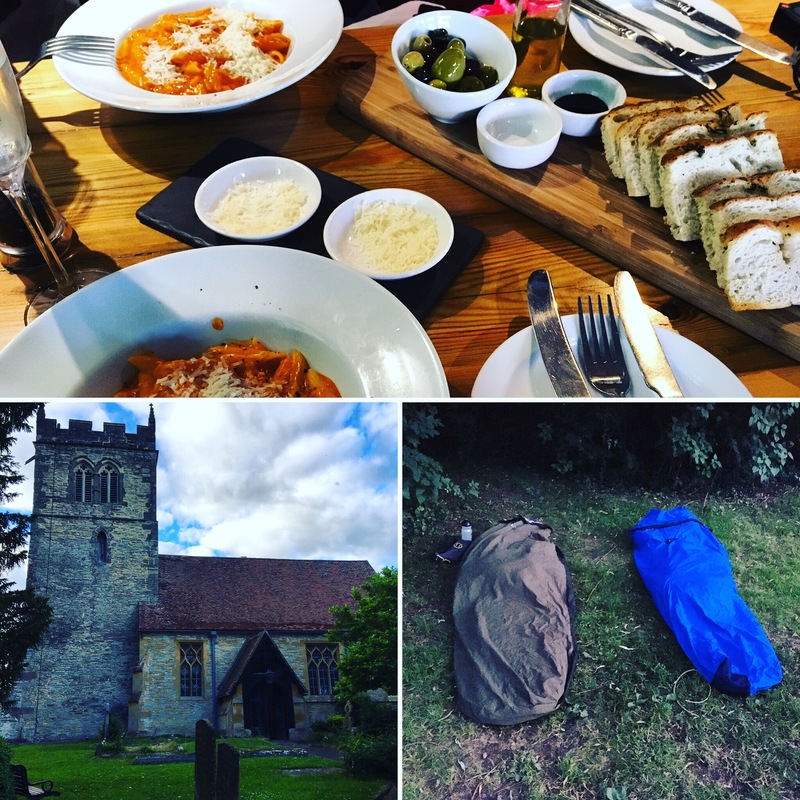 While taking a break, Julie and I had planned the final part of our route as we’d arranged to stay in York Youth hostel for the night and needed to head south rather than continue on south west to Pocklington with Sian and Esther. We agreed to part company just before the village of Coxwold. Esther and Sian headed on for the Howardian Hills and a few more kilometres. For Julie and I the route was fairly straightforward, heading down to Easingwold, avoiding the A19, and eventually on to York, arriving at the youth hostel just after 9.00pm. With another 212km ticked off we rewarded ourselves with a right good curry in the local pub. This week I’m having a recovery week which means a few less miles on the bike and a few more hours planning the training weeks ahead. I need to start building up the amount of consecutive long days in the saddle and that means planning a few mini adventures with overnight stops. 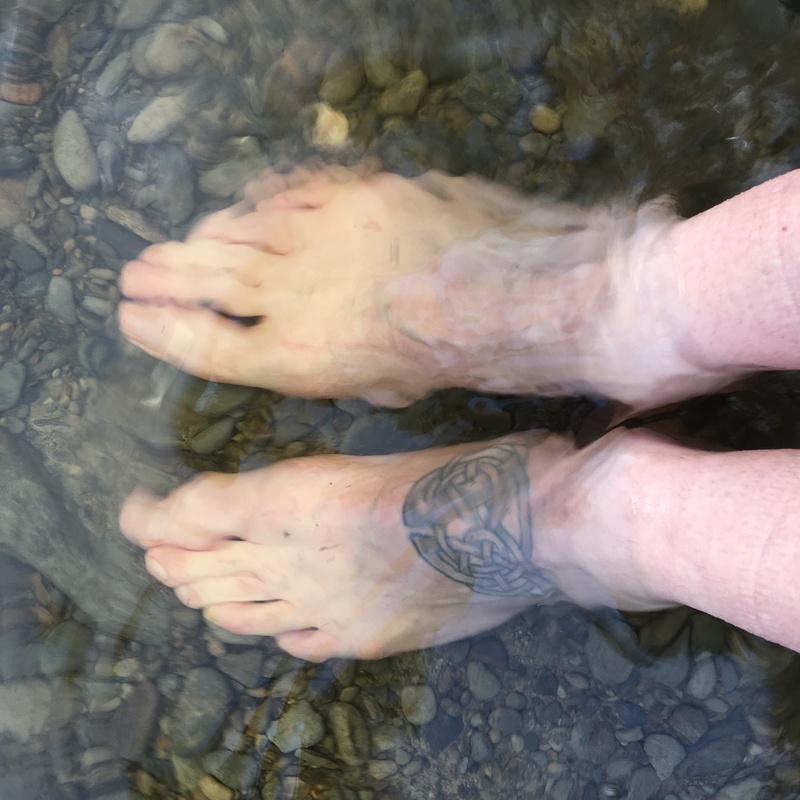 Occasionally friends remark about how brave they think I am for taking myself off on multi-day rides and mini adventures, but if I can do it then I’m pretty certain that anyone can. For me, especially at the moment while I’m training for the TCR, solo riding is a necessity as I need to get the miles in at a time that works best for me. Although it’s always great to have company on a ride, if I had to wait for someone else to accompany me I might be waiting a long time and could miss out on the opportunity. It’s not really about being brave, as any good girl guide will tell you, it’s about being prepared. If I’m going off for a few days I like to make sure that I spend plenty of time beforehand making sure that I know where I’m heading and what’s in store along the way. That way I can feel confident in my own abilities to deal with whatever comes along. However, you can’t always be prepared for everything, so I’d say that as well as being prepared you also need to be flexible. Having the ability to pull a ‘Plan B’ out of the hat when needed can often be more important than planning everything down to the last detail. The most important thing is to have a go and don’t worry too much if things go off-plan – I’ve made loads of mistakes but found a way around them and most of them were a good lesson learned for next time. 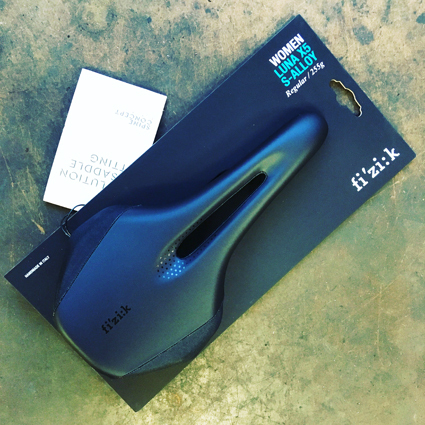 How far do you want to ride each day? 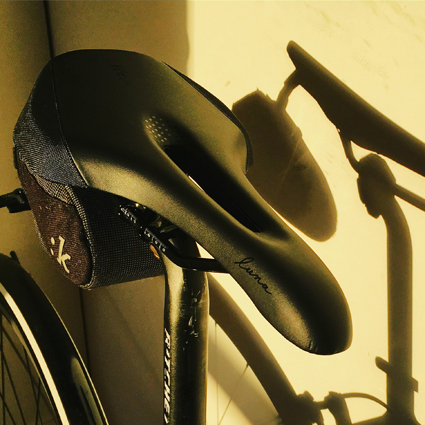 How many hours do you want to spend in the saddle? How much climbing do you want to do? How many stops do you want to make en-route? 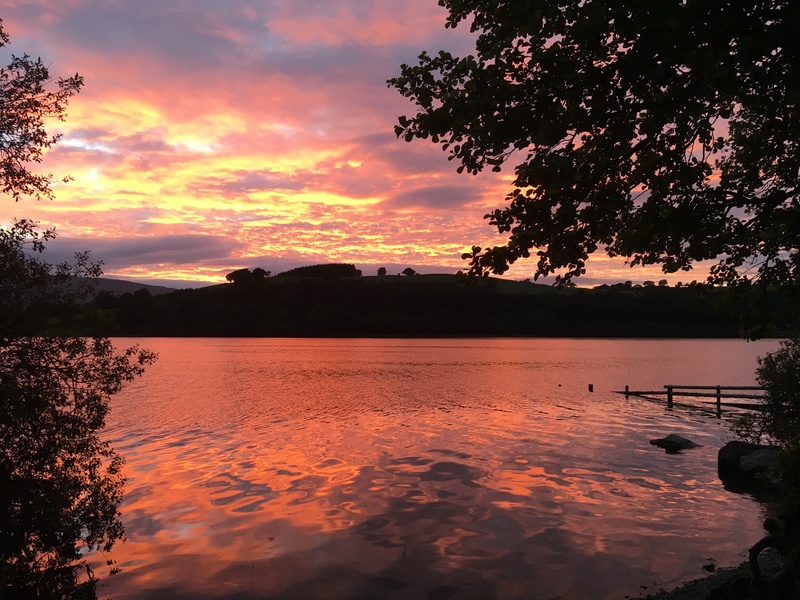 If you’re a bit nervous about giving it a go then you can still have a great multi-day adventure on your doorstep by building a circular route around where you live. You’re much more likely to feel confident if you’re cycling on roads that you’re familiar with. If I’m cycling in an area that I know very well, like the Peak District and Pennines, I rarely take a map or plot a route because I know the roads, how to get myself home from there and how long it’ll take, but if I’m heading over to an area that I don’t know well then I’ll spend a lot more time on route preparation and familiarisation. You might think that these days when most of the routes that we plan or follow are loaded up onto a GPS device like a Garmin or phone, figuring out where you’re going on a map is less important than it used to be – it’s not. I find it much easier to visualise the route that I’m on if I’ve initially plotted it on a real-life OS map. As I’m cycling through towns and villages there’s something very reassuring in the process of recalling that I’ve seen the name of said village previously on a map. Maps are also the best way to check out hill contours and those little ‘double-arrows’ if you’re trying to avoid steep hills. If you need to brush up your map reading skills the YHA run some excellent navigation courses at Edale Activity Centre (http://www.yha.org.uk/edale-activity-centre). They’re primarily aimed at hill walkers but the core skills are the same for any outdoor pursuit. If you’re going to rely heavily on a piece of tech then you need to make sure that you’re comfortable with how it works and that your routes are loaded correctly before you set off. There are lots of different brands and models out there. I use a Garmin Edge 510 because I like the simplicity of following a clear line and the battery lasts a bit longer. Other people prefer models with maps as they’re useful if you need to take an unplanned diversion. I have to say that although the tech is improving all the time, they all have their little foibles and the only way you can learn what they are is by getting out there and using your device. Remember that sometimes your electronic device can go wrong, run out of juice, or for some reason you may need to take a detour, cut your journey short and take a short-cut to the nearest train station. I’m not suggesting that you cart along several OS maps with you – they’re bulky and weigh too much – but as a back-up I always take along the relevant pages from a road atlas. They don’t take up very much space (you can slip them in your jersey pocket inside a little plastic bag). If it’s a few pages, to make life even easier, I draw the route on with a highlighter pen so that i can orientate myself quickly if I need to. You’ll feel much more confident about the route that you’re taking if you’ve plotted it yourself. You can plot your own course with the Garmin Connect software or with a third-party app like Ride with GPS or Strava. I tend to stick to the Garmin software because I’ve had a bit of trouble with my Edge 510 corrupting after importing courses from other apps in the past. When you’re plotting rides online always keep an OS map handy to check that the route you’ve chosen is actually a right of way. Both Garmin Connect and Google Maps often shows bridleways and tracks as roads and I’ve often ended up riding on a track that looked like a road on screen when I was plotting the route. If you want to check the surface of a road then Google Maps Street View is also a good resource. Strava also has a useful option that enables you to look at the most popular routes taken by other riders. If you have to use a route that someone else has plotted, familiarise yourself with it and draw it out on a road map before you set off. NCN cycle routes can be a bit hit and miss (http://www.sustrans.org.uk/ncn/map). 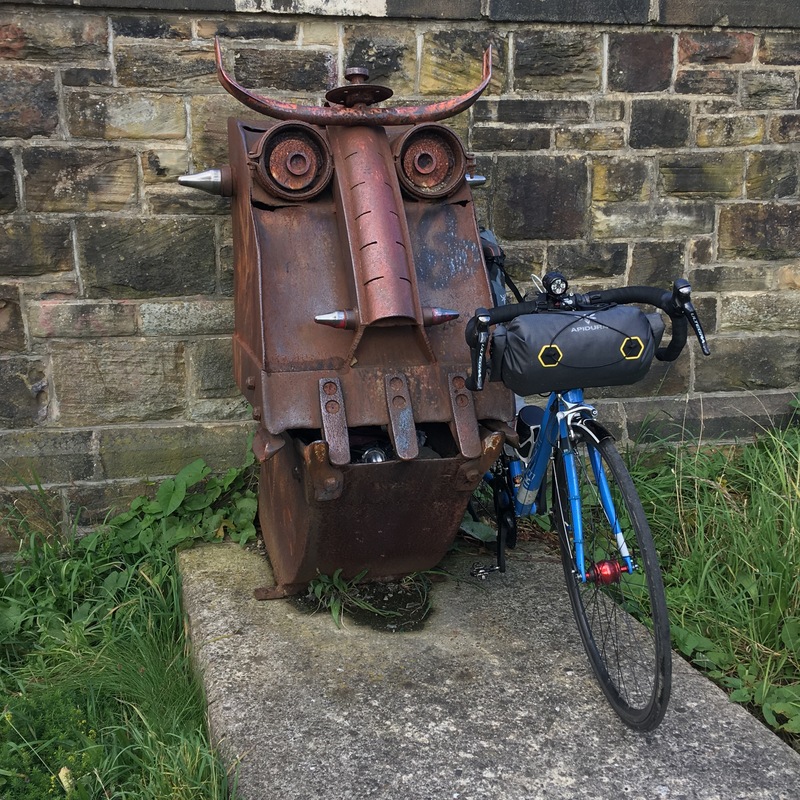 Some of them are great – like the on-road NCN 6 from Preston to Lancaster – but some of them are a bit rubbish – like the off-road NCN 68 between Whaley Bridge and Buxton, which is pretty impossible to ride on a road bike. Poorly-surfaced tracks and bridleways can end up adding a lot of time to your journey and unless you know in advance you can get caught out. Trust me, I’ve been there. Again, I’ve learned this the hard way. I used to keep all the info I needed on my phone but if you get delayed and it runs out of power, or it accidentally gets damaged, then you’ve not got any way of getting in touch with your hosts to let them know that you’re still on your way. You might not be able to get access to a plug to charge your devices when you stop. A little portable power supply like an Anker Astro Mini only weighs 85g and will set you back a tenner from Amazon. It’ll charge your Garmin or your smart phone a couple of times while you’re on the road. Lots of bike shops run maintenance sessions where you get to watch the shop mechanic run through a few basic maintenance skills in an hour or two – what a waste of time! You need to be able to practise doing it yourself on your own bike in order to learn. Try to find a local beginner’s maintenance course where you get to work on your own bike in a supervised environment. This type of course may be longer in duration but you’ll learn so much more. Alternatively see if there’s a local bike kitchen or drop-in workshop where you can hire tools and practise maintaining your own bike. Once you’ve been on a course, keep practising so you don’t lose your new skills. You can always keep an old inner tube at home to practise fixing a puncture on while you’re sitting at home watching telly. Even if you’re taking a few spare tubes with you, take a puncture repair kit too (a proper one, not self-adhesive patches) Sometimes you can be really unlucky – I once had four punctures in one day.